It’s on with the show at Disney’s Hollywood Studios, where guests of all ages are immersed in the glitz, glamour and excitement of show business — strolling down Hollywood Boulevard surrounded by the sights, sounds and personalities of Tinseltown in the 1930s; blasting off on a wild VIP limousine ride with Aerosmith as the guide; or becoming immersed in the world of big-budget movie car chases and the excitement of high-flying stunt performers. At the 2017 D23 Expo, Disney announced that the Great Movie Ride would be closing to make way for a brand new attraction themed after the new Mickey Mouse cartoon shorts, called Mickey and Minnie’s Runaway Railway. This will be the first Mickey themed ride. Walt Disney Imagineers are working on a new “2 1/2 D” experience to completely immerse riders in the cartoon world without needing 3D glasses. The Great Movie Ride closed August 13, 2017. In August 2015, a major expansion project was announced for Disney’s Hollywood Studios. Two new and exciting areas will be introduced to the park. 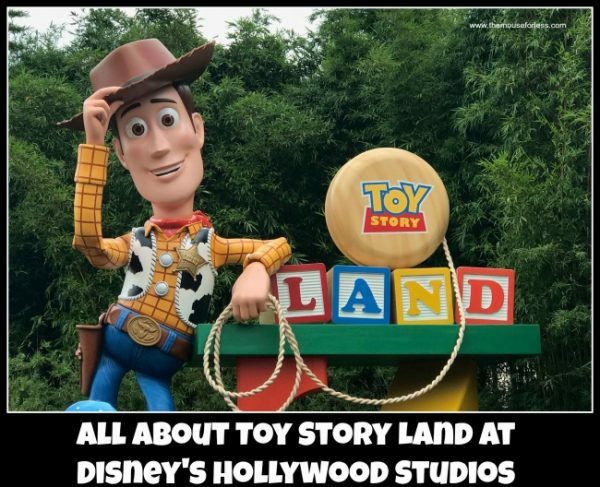 Toy Story Land is a new 11-acres land that transports guests into the adventurous outdoors of Andy’s backyard. Guests will feel like they have been shrunk to Buzz and Woody’s size as they are surrounded by oversized toys, building blocks, plastic buckets and shovels and game board pieces in Andy’s backyard. Two new attractions will be a part of the new land, along with the expanded Toy Story Mania! Slinky Dog Dash – This family friendly coaster will feature a track that Andy built. There will be drops and turns that Andy has created to stretch his slinky dog to the limits. Alien Swirling Saucers – The famous little green aliens from the movie will take Guests around for a spin in their very own flying saucers. The music, lighting and sound effects add to the flurry of action, while “The Claw” looms over. Toy Story Mania! – Guests glide into the Toy Story Midway Games Play Set and take aim at 3D objects in a variety of fast-paced games, with an expansion that adds a third track to this popular attraction. The third track is scheduled to open on Memorial Day weekend. The second part of the expansion is the introduction of a 14-acres Star Wars themed land. This area will feature new and updated attractions. Visit our Star Wars at Walt Disney World page for details on this section of the expansion. Are you a fan of Monsters Inc? You’ll want to head over to Walt Disney Presents (formerly Walt Disney: One Man’s Dream) to meet both Mike and Sulley. Guests who love The Incredibles should head to the former Pixar Place to Municiberg for the Incredible Celebration. Here Guests will be able to meet Edna Mode, as well as participate in the Super Shindig Dance Party. Guests who love Olaf will want to head to the Echo Lake district for the all-new Celebrity Spotlight. This is your chance to meet Olaf from Disney’s “Frozen.” Olaf is living his dream “In Summer,” chilling on the beach and ready with warm hugs for all his friends. Star Wars: A Galactic Spectacular fireworks display has joined the list of Hollywood Studios entertainment. This show features amazing projections and fireworks shot to the memorable Star Wars score. Deciding what ticket to get for your visit to Disney’s Hollywood Studios is no simple matter. You can get a ticket with one-day’s worth of admission, a ticket with 10-days worth of admission or something in between. You can also add options like a Park Hopping or Park Hopper Plus (which includes water parks, miniature golf and golf at Disney’s Oak Trail Golf Course, and ESPN Wide World of Sports Complex). Other admission options are available such as Walt Disney World annual pass, Florida resident passes and more. For detailed information on Walt Disney World admission options visit MFL’s “Walt Disney World Tickets” page. Lights…camera…and the stage is set for plenty of action! The glitz and glamour of Hollywood takes center stage at Disney’s Hollywood Studios. But the star is you! Beauty and the Beast, Lightning McQueen Racing Academy Rock ‘n’ Roller Coaster, The Twilight Zone Tower of Terror, Fantasmic! Slinky Dog Dash, Alien Swirling Saucers, Toy Story Midway Mania! 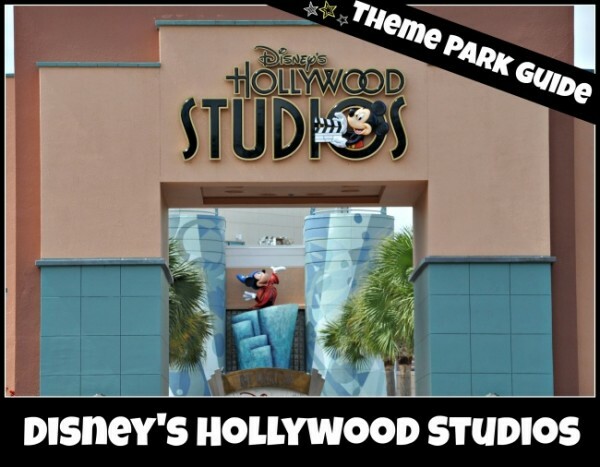 Print out a copy of the Disney’s Hollywood Studios Hidden Gem pocket guide from our Pocket Guide page and have more fun in the park discovering the hidden gems. Pick up a Disney’s Hollywood Studios Times Guide as you enter the park for important information such as park hours, special hours, show times, parade and fireworks times, character greeting times and other park hours to help you plan your day. Throughout the park Disney PhotoPass photographers will capture guests caught up in the Disney experience. Disney’s PhotoPass and Memory Maker gives guests the opportunity to have great high-resolution photos taken by Disney Photographers using state-of-the-art digital equipment at picturesque locations. Even better, your photos can be accessed, shared, and ordered online. Visit our Disney’s PhotoPass Guide for more information on Disney’s PhotoPass service. Mothers with infants can visit Disney’s Hollywood Studios worry free with the services of the Baby Care Centers. The Baby Care Center is located near the main gate at the Guest Services Building. The facility offers Guests a place to feed, change and nurse babies. Highchairs, rocking chairs, nursing rooms, changing tables and a microwave to heat bottles and food are available. The Baby Care Center also offer formula, bottles, pacifiers, children’s Tylenol, cold and allergy medication, band-aids, Motrin, children’s undergarments, t-shirts and baseball caps for Guests to purchase in those “baby emergencies”. 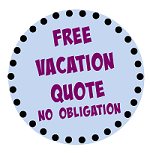 Stroller rentals are available for single day rentals as well as length of stay. Visit MFL’s Stroller page for detailed information on stroller rental. There’s nothing more frightful to parents than the thought of losing their child in the ocean of people inside a theme park. There are many fascinating distractions at Disney’s Hollywood Studios and children can wander off in a blink of an eye. Be prepared so that you won’t spend precious vacation time frightened and in search of each other. Have a plan, before your vacation, make and print some Kids Travel IDs. There are many designs to choose from, they’re easy to make and children love to have their own ID cards. *Tip*When you enter Disney’s Hollywood Studios at the beginning of the day, take a picture of your child from your camera, phone or by a Disney Cast Member on your Photopass so that you can readily show a Cast Member what your child is wearing and what he/she looks like if you should become separated from your child. Set up a meeting area in the park. Locate a Cast Member so that your child can meet a Cast Member “in person” and will not be afraid of them. Let your child know to look for Cast Members with Disney ID tags and to show the Cast Member their ID cards if they could not find you. If you become separated, stay in the area and enlist the assistance of a Cast Member to search for your child. Most likely your child is in the same vicinity looking for you. If you have not located your child after searching the area, and there are more than one adult in your party, split up and have one go to the pre-determined meeting location while another follow the direction of a Cast Member. All lost children will be taken to Lost Children inside the Baby Care Center by a Cast Member if they can not locate the parents in the immediate area. Walt Disney World attractions require children under the age of seven to have someone age 14 or older with them in the “same” ride vehicle and in the “same” row or the row directly behind them. Certain attractions also require guests to be of a certain height to ride. Visit our Height Requirement page for height requirements to all Walt Disney World attractions. Walt Disney World offers Rider Switch so that as many guests as possible can experience an attraction. MouseForLess Tip: For those traveling with kids it may be important to consider educational opportunities at Walt Disney World. Guests staying at Walt Disney World Resort hotels can enjoy more time in the theme parks with the enhanced Extra Magic Hours (EMH) benefit. Each day, one of the theme parks opens an hour early, or stays open two hours extra after regular park hours. This benefit offers guests more time to enjoy shorter lines during these extended theme park hours. There is no charge for this Disney Resort guest benefit. Dates and times for EMH very throughout the year. Go to Extra Magic Hours Schedule for the current schedules. Not all attractions are open during EMH. For details and a list of attractions currently listed as open during EMH go to MFL’s Extra Magic Hour Information page. FastPass+ is a great system that lets you “eliminate the wait” at the most popular park rides and attractions. Nothing feels better than being able to bypass this wait and jump straight to the front of the line. FastPass+ allows guests staying at a Disney-owned resort to book up to 3 FastPasses+ selections per park per day up to 60 days in advance or off-site guests to book up to 3 attractions per park per day on the day of their visit. For specific information, tips, and strategies about using Fastpass+ in Disney’s Hollywood Studios, visit our guide. Visit our FastPass+ Guide for more details on FastPass+, and great MouseForLess tips on how to use utilize this great tool to it’s fullest. Visit our MyMagic+ to get information about using MagicBand during your park visit. Fireworks at Disney’s Hollywood Studios include a show that it not a traditional fireworks show, and a Star Wars fireworks display. The nighttime spectacular Fantasmic! is presented in its own theater on Sunset Boulevard, this show takes guests inside Mickey Mouse’s dreams (and nightmares!). Here there are a multitude of characters, huge water screens, and laser lights. Will good prevail in Mickey’s dreams? Star Wars: A Galactic Spectacular fireworks extravaganza has begun at Disney’s Hollywood Studios. This show features amazing projections that include laser lightsabers in the sky along with fireworks to the legendary Star Wars music score. Prior to the Star Wars: A Galactic Spectacular fireworks, Guests can experience the nighttime projection show called Disney Movie Magic. Disney Movie Magic is a 10 minute projection show on the Chinese Theater at Disney’s Hollywood Studios featuring fantastic projection mapping technology along with vibrant lasers. The Disney Movie Magic nighttime show is a tribute to the great live action Disney movies of the past. There are two options to enhance the nighttime show experience. First, the shows works with the Made with Magic merchandise. This allows the guests’ ear hats to interact with the music of the show. Make sure you check out the special Disney Made With Magic merchandise items that interact with certain shows at Walt Disney World. Second, for guests wishing to have reserved seating for Fantasmic, a Fantasmic! Dining Package is offered. and a Star Wars dessert party is offered. Guests to Disney’s Hollywood Studios may bring coolers smaller than 24″L X 15″W X 18″H. Coolers will be inspected and no glass containers or alcoholic beverages are allowed. For those who prefer to leave the cooking to Disney, the following selections are available. Click on the name below for menu. Visit our WDW Menu Page for a complete list of menus available for Walt Disney World. 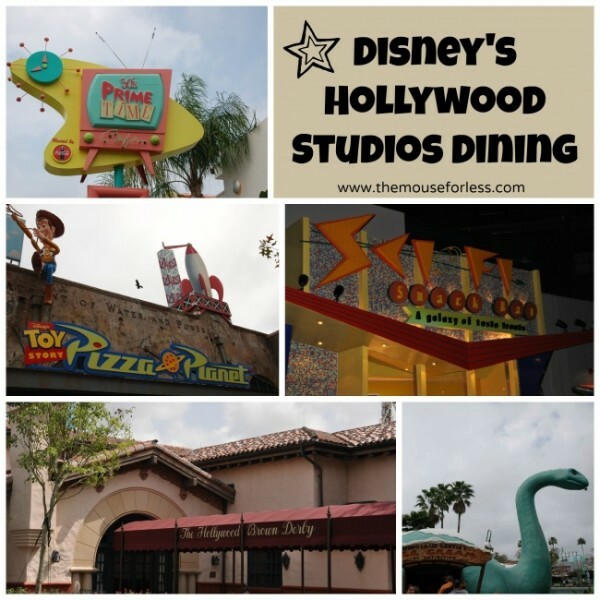 If you are on the Disney Dining Plan you can print out a pocket guide for Disney’s Hollywood Studios in our Pocket Guide page. There are two locations for lockers at Disney’s Hollywood Studios- one inside the park and one outside of the park. Outside lockers are located by the Bus Information. The lockers inside the park is located at Oscar’s Super Service. Guest lockers have been upgraded at all Walt Disney World theme parks. The process for renting a locker has now changed, as each locker location is now equipped with a self-service kiosk. Guests paying with cash or credit card may now proceed directly to the kiosk to rent a locker. Guests paying with a MagicBand or gift card should see a Cast Member at the nearest merchandise location where the Cast Member will provide the Guest with a code to access one of the lockers. Lockers are available in Standard (12.5” X 10” X 17”) size for $7.00 and Large (15.5” X 13” X 17”) size $10 per day. Guests are no longer required to pay a deposit when renting a locker. Disney After Hours is a specially-ticketed event held in Disney’s Hollywood Studios that gives Guests the opportunity to ride most attractions with minimal waits after the parks have closed for the evening. Guests who are interested in guided tours can take advantage of some excellent tours that have stops at Disney’s Hollywood Studios. “Backstage Magic Tour” provides a detailed peak behind the theme park magic, including access to the legendary underground Utilidors. “Disney’s Yuletide Fantasy Tour (Seasonal)” is a behind the scenes tour at Disney’s Hollywood Studios that shows how holiday Magic is created at Disney World. 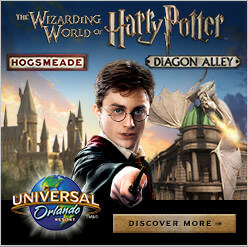 To reserve tours call (407) WDW-TOUR or (407) 939-8687. 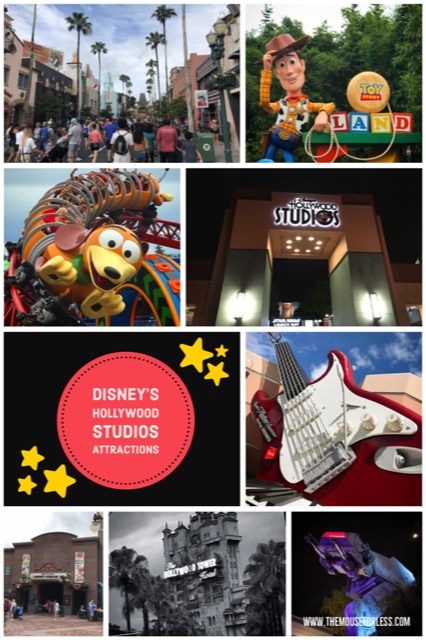 Visit the Disney’s Hollywood Studios section of Disney Backstage Tours & Experience page for details, prices and restrictions for each tour. For the convenience of Guests with disabilities, wheelchairs, and Electric Convenience Vehicles (ECV) are available for rent at Disney’s Hollywood Studios. The wheelchair rental fee is $12 with no deposit required. The ECV rental fee is $50 per day plus a $20 refundable key deposit. The rented unit must be returned to the original rental location to receive a credit card deposit refund. Quantities are limited and subject to availability. For Guests who require a wheelchair rental for multiple days, a Length of Stay rental ticket is offered for $10.00 per day. The wheelchair rental location at Disney’s Hollywood Studios is at Oscar’s Super Service inside the main entrance of Disney’s Hollywood Studios. Guests can ask for a Guidebook for Guests with Disabilities. Disney’s Hollywood Studios can accommodate Guests with mobility, visual and hearing disabilities. Refer to the guidebook for more details on special restrictions and seating areas. Trained service animals are welcome at Disney’s Hollywood Studios and are allowed in most locations. Not all attractions can accommodate service animals. In those instances a member of the Guest’s party must remain with the animal. All service animals must remain on a leash or harness at all times. Disney’s Hollywood Studios allows Guests to use backstage locations for service animal to take breaks and relieve themselves. A Cast Member must accompany the Guest to the designated backstage areas. The areas allowed are at the main entrance near the Kennel, Backstage near Star Tours, Backstage near Courthouse, Backstage near Toy Story Mania!, Backstage near the restrooms at Animation Courtyard and Backstage near the Theater of the Stars. Most restrooms are designed for access by Guests using wheelchairs. Companion-assisted restrooms are available at the following locations: First Aid, Opposite “The Twilight Zone Tower of Terror“, Fantasmic!, Opposite of Star Tours, near Rock ‘n’ Roller Coaster Starring Aerosmith, near Toy Story Mania!, to the right at the entrance to Lights, Motors, Action! In addition to Walt Disney World buses running to Disney’s Hollywood Studios from individual Walt Disney World resorts, Disney has added park-to-park buses on a permanent basis. Disney’s Hollywood Studio guests can catch buses running to and from the Magic Kingdom, Animal Kingdom and Epcot at approximately every 20 minutes throughout the day. The direct bus to Magic Kingdom from any park still goes to the Transportation and Ticket Center and you have to take the ferry or monorail to the park. Park guests may also take a water ferry from Epcot, Disney’s Boardwalk Inn, the Yacht and Beach Clubs and the Swan and Dolphin resorts to Disney’s Hollywood Studios park. For Parking Information see our Parking at Walt Disney World page.